Like a fingerprint or a snowflake, no two teeth are alike. Your teeth are unique to you – not even identical twins have the same teeth! And just as your teeth are unique to you, so is your dental health. Many factors influence how healthy your mouth is, like family history, hygiene practices, and chronic health conditions. Reducing your risk of tooth decay may include different steps than those others take. Diabetics, for example, have a higher risk of gum disease. That means their preventive care routine has an even larger impact on their overall health than someone without the disease. More than 100 million U.S. adults are diabetic or prediabetic. 23.8 percent of people with diabetes are undiagnosed. Almost one-quarter of individuals with diabetes don’t even know it. Around 1.7 million new cases are diagnosed each year. Diabetes and dental health go hand-in-hand! Your dentist can help you watch out for the warning indicators of decreased dental health and diabetes, which affect every part of your body. Dental health and overall health are connected. Bacteria in the mouth are sticky and soft; they naturally form a substance called plaque. When plaque builds up on the teeth and along the gum line, it becomes hard. Hard plaque is called tartar, and it can only be removed by a dentist with a special instrument. Thankfully, that process isn’t painful. But when you don’t see the dentist and the tartar is left alone, it repeatedly irritates the gums and tissue. This can easily lead to infection in your gums, and diabetics are more likely to get one because of their weakened immune health. Diabetics often experience a dry mouth from both their medical condition and from medications. Saliva is a great tool for rinsing the teeth and dislodging bacteria, and your mouth misses it when it isn’t present. This can further complicate a diabetic’s oral health by contributing to tooth decay. A few indicators of tooth decay and infection are swelling, pain when chewing, and sensitivity to hot, cold, or sweet foods. The effect of diabetes on teeth and gums shouldn’t be ignored – it can lead to further health complications and the loss of natural teeth. Nearly 22 percent of those diagnosed with diabetes have periodontal (gum) disease. We encourage everyone especially diabetics to use their dental insurance carrier and their dentist as allies in wellness, especially diabetics. Dentists can help you maintain, if not improve, your oral and your overall health. Receiving professional deep cleanings from your dentist can help to lower your HbA1c (average blood sugar) levels. Dentists are trained on the effect diabetes has on teeth and gums. 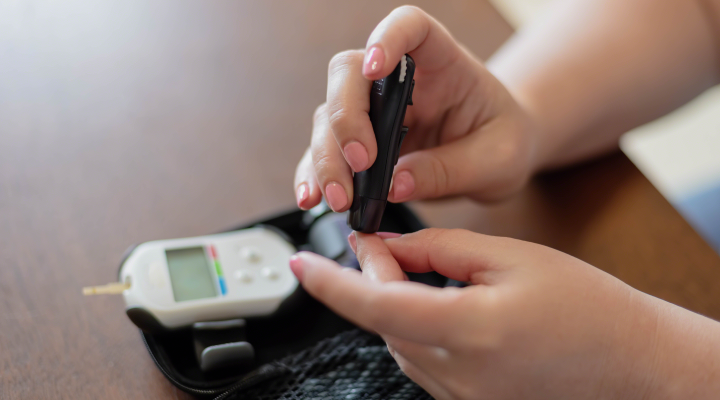 Type 2 diabetes is one of the most common types of chronic diseases in America, which is why it’s important to understand how to care for your oral health if you are a diabetic. To understand your current risk of developing diabetes, use this tool from the American Diabetes Association. It’s crucial that diabetics visit the dentist at least twice a year. This allows your dentist to ensure your mouth is healthy, and also allows them to document any changes they see. By continuing to see the dentist consistently, they are able to watch for the potential development of diabetic-related dental health problems. These include a change in saliva, a red or swollen palate, changes in the texture of the tongue, loose teeth, colored deposits on the teeth, or signs of cavities forming. Some insurance carriers (like Delta Dental) offer more cleanings for high-risk members, like those with diabetes. Call your carrier to find out if you may be eligible. About one in three adults over 18 are prediabetic, meaning their blood sugar is between 140 and 199 after repeating the initial test. Unless lifestyle changes are made such as healthier diet and exercise, prediabetic individuals are very likely to form Type 2 diabetes. Unfortunately, there are often no signs or symptoms when someone is prediabetic. That’s why it’s important to understand the risk factors for developing diabetes. This body mass index scale can help you determine your healthy weight, as being overweight is a contributing factor to the development of diabetes. Many factors influence your health, which is why it’s important to visit both your doctor and your dentist regularly to monitor your blood pressure, glucose levels, weight, oral health, and more. Check out our low-sugar recipes for reducing the risk of tooth decay and diabetes in your home.